It looks like we have a potential tetherball superstar on our hands. Check out the bay horse in this video. He totally loves his ball, and it looks like he's perfected the art of twirling it around while he stands in his stall. What a cutie! There are countless stall toys available for sale, and these balls are just some of the many options that horse owners have. Toys can help to keep horses entertained, especially if the horses spend long hours in their stall. Some horses have excess energy that they need to get out, and these toys provide them an appropriate outlet. But when horses have to be put on stall rest to recover from an injury, serious boredom can set in. Bored horses may start up negative behaviors, like weaving, cribbing, or wood chewing. According to Horse Junkies United, there are a number of ways to keep a stalled horse entertained. Toys, like the ball in the video above, are just one easy way to give your horse something to do when he can't go outside. Slow feed hay nets are another great way to keep a horse on stall rest occupied. These nets force a horse to eat his hay more slowly, making the meal last longer and keeping the horse focused on eating for a longer period of time. These nets can also keep your horse healthier, since the slower speed of eating keeps food in his stomach longer and more closely mimics a horse's natural grazing pattern. Don't forget about the power of the buddy system, too. Horses are herd animals and receive comfort when other horses are around. Many horses on stall rest are more content when there's another buddy in the barn with them. 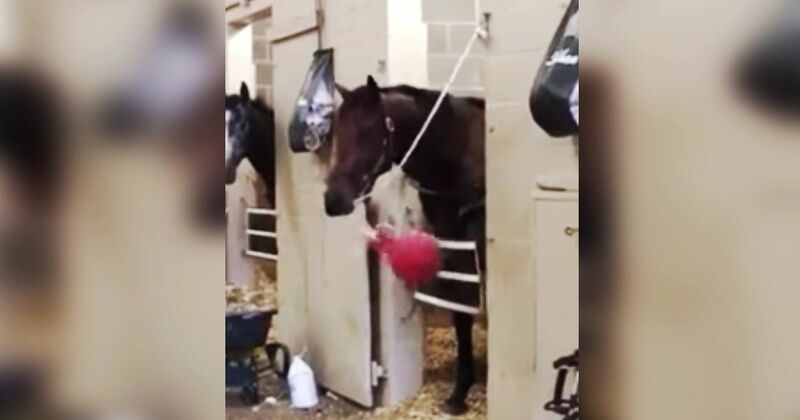 If you have a horse on stall rest, you may need to get creative to keep him entertained. Some food toys provide horses with large, hard blocks to lick, and this can keep horses occupied for longer periods of time. Try rotating toys in and out so that your horse doesn't get bored with one single toy. Some horses enjoy playing with things that aren't toys at all, like road traffic cones. It may take some experimenting, but with a bit of persistence, you can find some ways to keep your horse entertained.